If I was ever asked to pick one season as my absolute favourite- as tough a call as that would be- I would hands down choose summer because it's that one time in the year when you feel the best you. You can quite literally let your personal style run loose! You're not restricted by weather permitting outfits or having to wear at least four layers to feel remotely human. Dressing for summer and in particular festivals is easy, breezy and ridiculously effortless whilst allowing you to be as creative as you like with your style. When you think about it, it's kind of liberating! 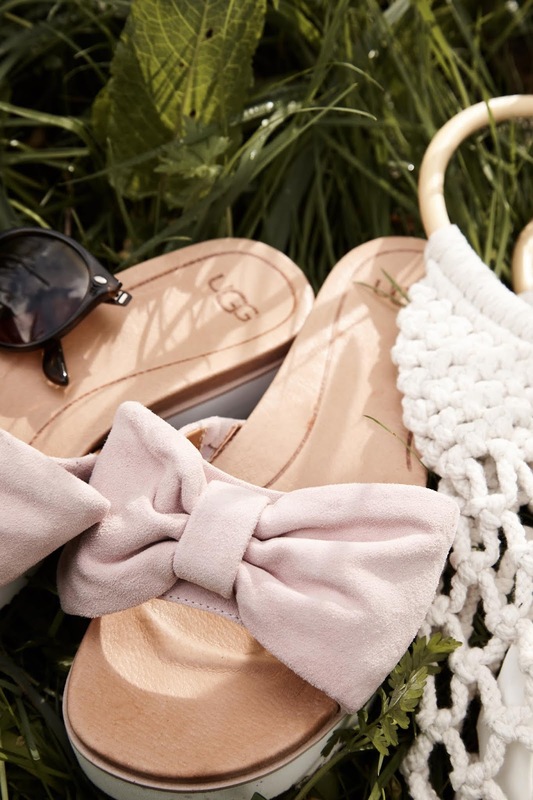 You can be as fun, bold and adventurous or as stripped back and simple as you please... That's why I love the new UGG's sandal range because they're ridiculously wearable with so many different summer looks, they give you the freedom to be as versatile as you like with your wardrobe with minimum thought! They're fun and fresh designs which give your outfit that little addition of playfulness we all kind of crave from festival style. My festival style is about capturing that real spirit of summer and being let loose to wear exactly what you like. Floral's always play a huge part in my festival wardrobe! They give you a great opportunity to play with colour and mix up different tones to give your outfit that real festival kick it needs. The Joan Platform Slide is a perfect pairing for florals as they come in four vibrant colours so you can mix and match either coordinating your sandals and your pattern or being a touch more daring with contrasting tones. The choice is entirely yours. As a rule I generally opt for my prints in loose, light weight fabrics as yes ok, you'll totally get that Stevie Nicks whimsical vibe but more sensibly they are deceivingly practical. Airy fabrics simply allow you to have all the fun in the sun whilst staying super smug and very, very comfortable... It's not rocket science but it is tried and tested! Comfort most definitely is key where dressing for festivals is concerned and this sentiment only enforces the importance of effortless style. For me it's not about over complicating your outfits. Choose pieces which are really adaptable and easily layered up or stripped down. Camisoles over tees, oversized army shirts which double up as a jacket and look great with a chunky knit or a slogan tee. Choose minimal effort footwear which is versatile to both the weather and your outfit selection! UGG's Sliders are a really perfect choice for high summer festival when you want comfort and breathability! They're simple yet sweet designs mean they're adaptable with virtually any look you choose and they're ideal for throwing on/off for when you're on the go or just lazing away the day in the grass!